Way back when, I started riding a bike as an easy way to make the monumental commute from Sacramento, CA to Palo Alto. 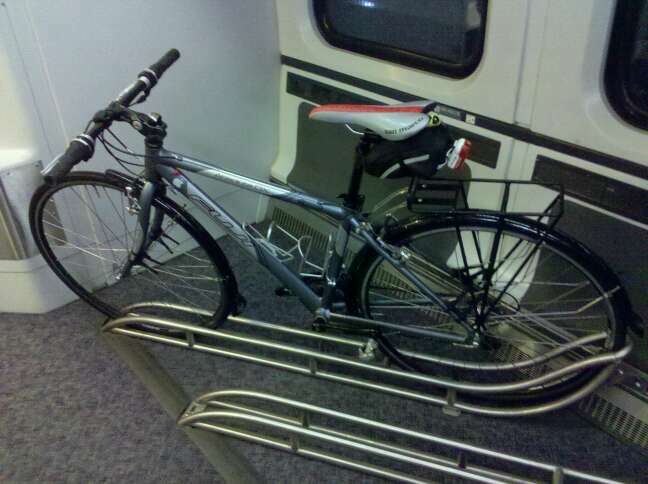 It was a 7 mile bike ride, to the Amtrak Capitol Corridor train, to a bus, to another train. I did it 3 days a week on average. The bike was a very practical thing, and I had a very practical bike. Saturday, June 20th. Sacramento, CA. Be a part of the development of a mountain bike park behind the Township Nine development. More details are on their Meetup page. The Sacramento Mountain Bike Skills Park is under construction on a back lot of the Township Nine development between N. 5th St. and N. 7th St. up by the river levee. Randy Spangler of IMBA and Terry Cox of College Cyclery are designing and building the park, starting with a pump track. We will also be working on a single track around the perimeter this Saturday. I seem to have become my own “Tale of two cities.” I’ve got one foot forever in Sacramento, and the other in San Francisco. Being a man of two cities, I have an interesting perspective on the cycling in both of them. I’m continually comparing and contrasting them both. I keep coming back to on inescapable conclusion: Sacramento is an awesome cycling town. Sacramento was treated to some fantastic pro racing as the modified stage 2 course of the 2011 Amgen Tour of California offered 3 circuits around the state capitol building. A breakaway of 4 riders struggled to stay ahead of the peloton, but were caught before rolling onto the streets of California’s capitol city, where huge crowds waited despite the threat of poor weather. If you are planning on attending the finish of Stage 2 of the Amgen Tour of California. Sacramento can be tricky it park in and negotiate on a good weekend day. Throw in all of the traffic for a major cycling event and you’re likely to find yourself walking miles even if you do drive downtown. However, Sacramento Area Bicycle Advocates (SABA) are helping to solve this problem for you. According to an Examiner.com article, Sacramento is ready to start adding more painted bike lanes to downtown Sacramento streets over the next 18 months. The plans aim to create an environment downtown which resembles the bike-friendly portions of midtown, where cycling is popular and bikeways are more common. This seems in line with what appears to be a growing trend of bike-friendliness throughout the region.